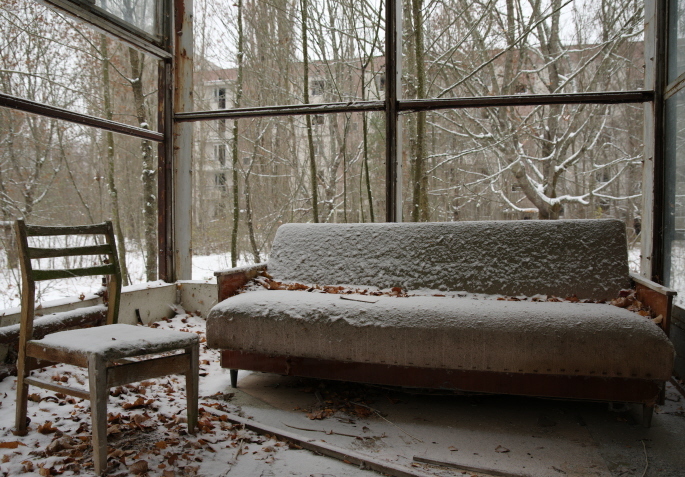 More background info: Pripyat was a town built from 1970 in parallel with the construction of the nearby Chernobyl NPP. Initially it mostly housed the workers building the plant. 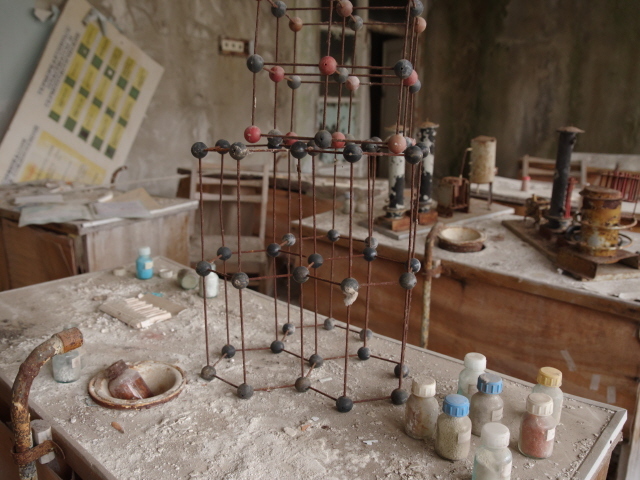 Later, once the NPP had become operational, Pripyat increasingly became the home of those engineers, workers and scientists who actually operated the plant … They happily moved into shiny new Pripyat with their families. 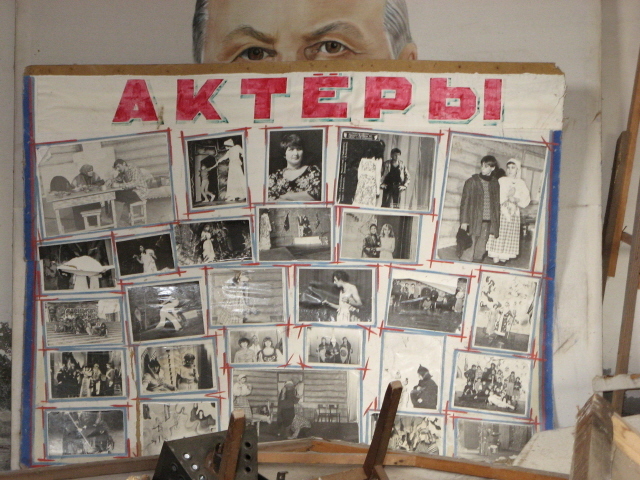 It was a typical planned Soviet town of prefab apartment blocks, a cultural centre, which was also the main hub of Soviet ideological training, schools, kindergartens, hospitals, sports centres, a cinema, various shops ... everything a town needed. And more, in fact. Soviet employees at nuclear power stations were somewhat privileged (like those toiling away in prestigious far-away coal mines, e.g. in Pyramiden), so they had a better standard of living than many others. Pripyat was recategorized as a city in 1979. Its population peaked at just under 50,000, and the inhabitants lived in over 150 apartment blocks of various sizes. 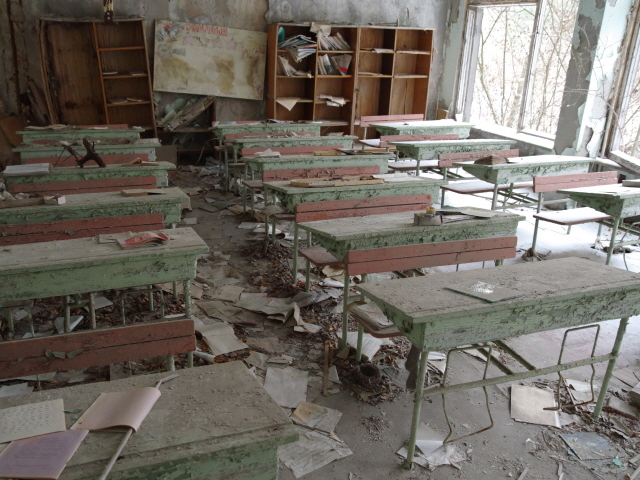 And then came April 1986 and the Chernobyl disaster and the city's life was abruptly shattered, finished, never to return – for details about what happened at the plant see the Chernobyl NPP chapter. 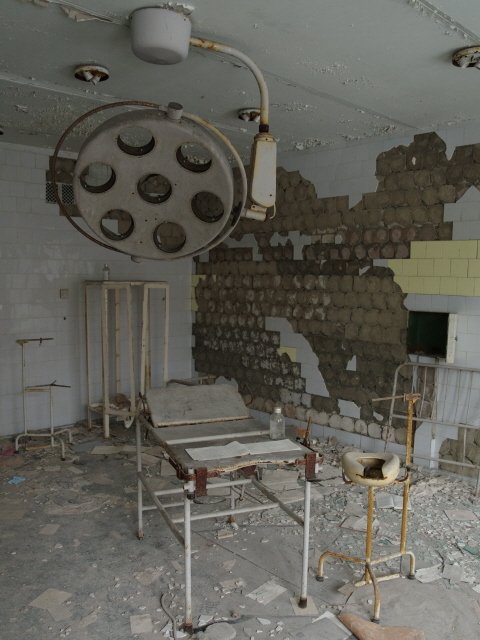 The city of Pripyat, only 2 miles (3 km) from the burning reactor, was initially not even informed of the accident. It was more than 24 hours after the explosion that an emergency evacuation was finally begun. Late in the morning of 27 April a fleet of over a thousand buses filled the streets of the city and loudspeakers announced that there had been an incident at the plant and people had to leave. 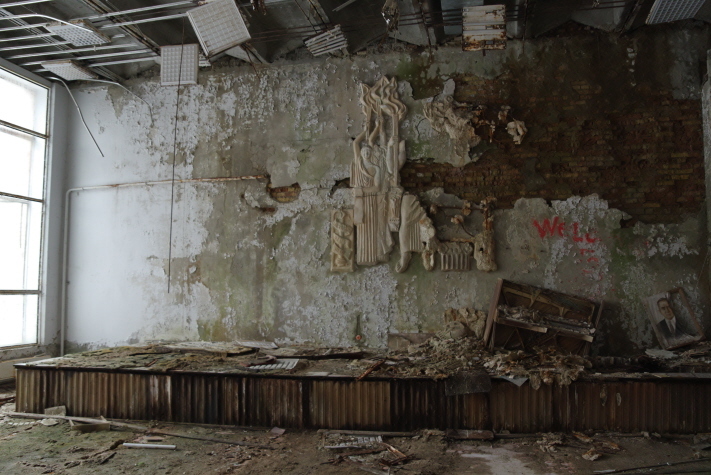 The residents of Pripyat were told that it would only be a temporary measure and they should only pack a suitcase with essential belongings, some food and a change of clothes. Most of the nearly 50,000 inhabitants who were then driven away were never to return to their homes. 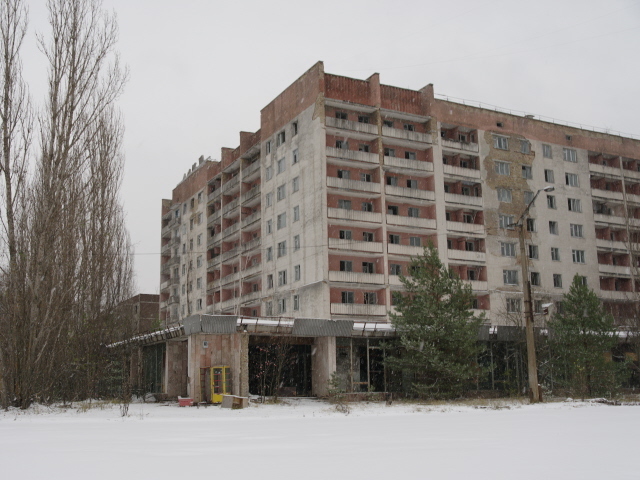 Instead a large number of the former inhabitants of Pripyat were eventually rehoused in the purpose-built new town of Slavutych, 30 miles (50 km) to the east, to live basically in exile. 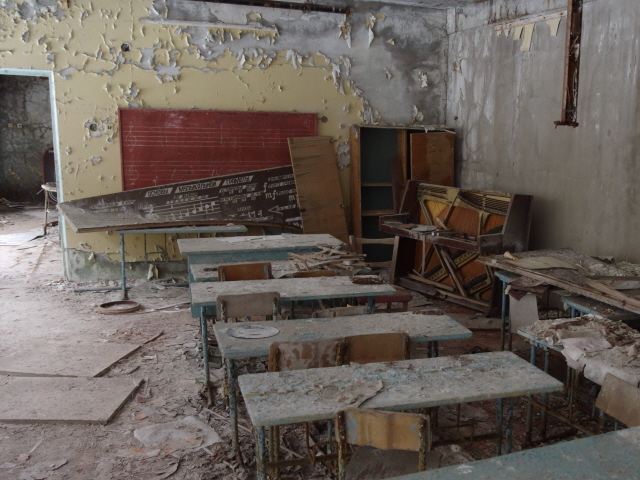 The town is still very much linked to the Chernobyl NPP, however, though now mostly to its decommissioning. There's a commuter train line linking the new town directly to the Chernobyl NPP, shuttling thousands of workers there and back every day. In November 2018 I went to Chernobyl via Slavutych and took the very commuter train used by the workers to get to the Zone, which made for quite a difference to the usual entry point by road at Dytyatky. Only very few tour operators offer this Slavutych/train option, though. Another ca. 50,000 people were also driven from their more rural homes as the Exclusion Zone was declared around the disaster area (only a few old subsistence farmers later returned, illegally, as so-called self-settlers – see under Chernobyl in general). Countless villages too still lie abandoned. 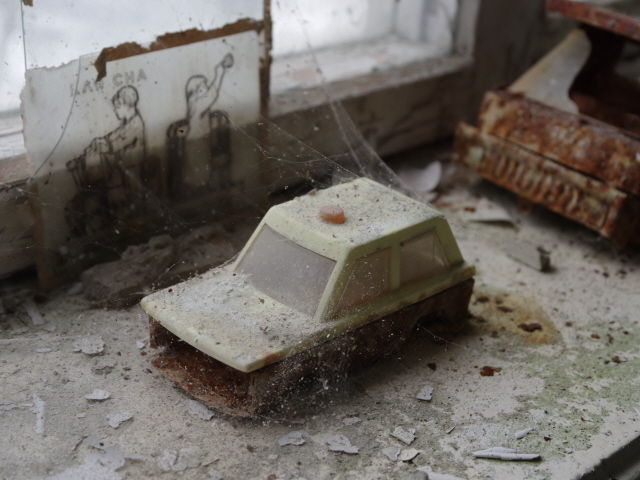 What sets Pripyat apart from many other abandoned towns is, for one thing, that the abandonment happened so quickly, overnight as it were, unexpectedly and so incompletely. Only the people were gone. But almost all of the props of their material life were just left behind as if everybody just dropped everything and just went away (which is more or less exactly what happened). Furthermore, its location within a nuclear Exclusion Zone prevented the worst of the looting that normally follows abandonment if looters can get free access. 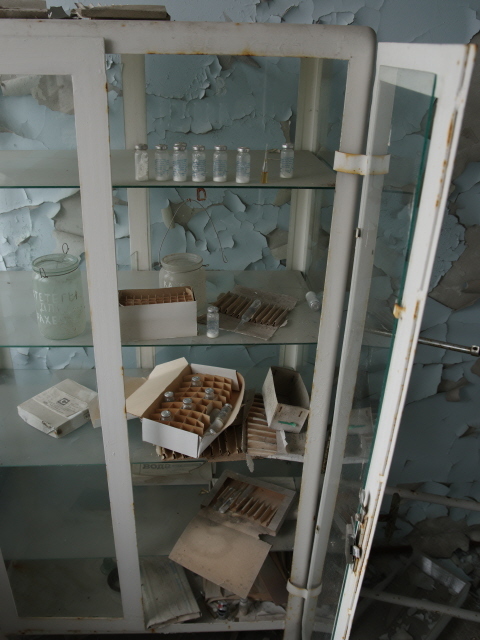 There HAS been a lot of looting in Pripyat as well, but nowhere near to the completely strip-it-bare degree as has happened in other such abandoned places (esp. 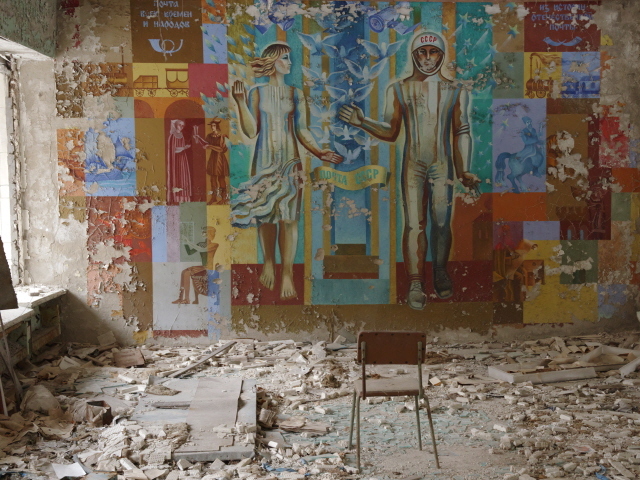 Agdam – the largest ghost town on Earth). Not only has there been looting – i.e. things taken away (in particular anything made of metal). 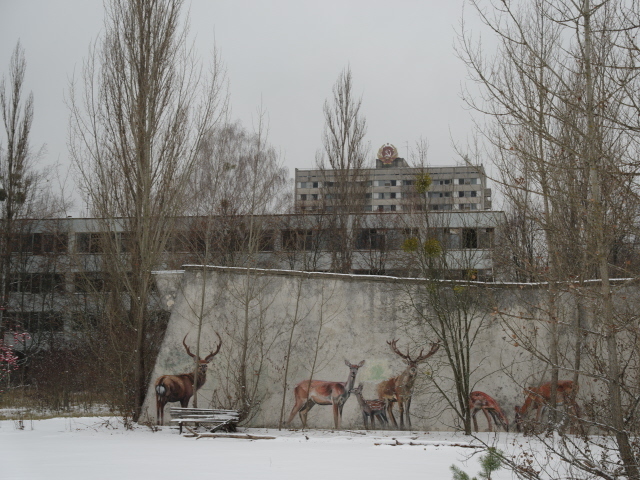 Things have also been added, in particular graffiti, and quite a few of the most atmospheric images that Pripyat is so famous for, are in actual fact “staged” to a degree. 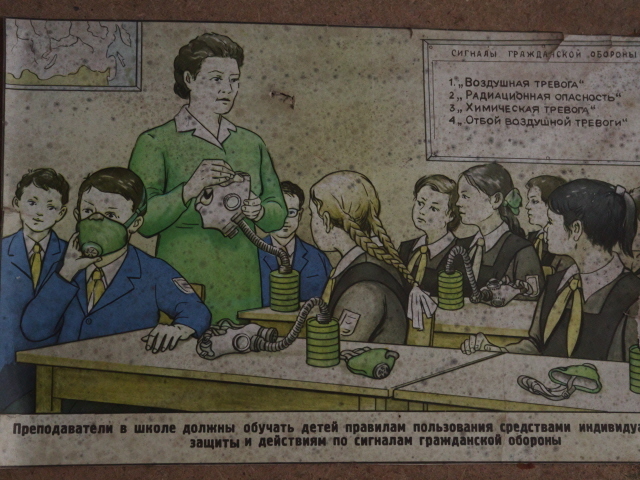 For instance, the very famous image of the floor covered with gas masks. These weren't something left behind at the evacuation. It was rather that somebody later discovered a box full of these masks and decided to spread them around like this. 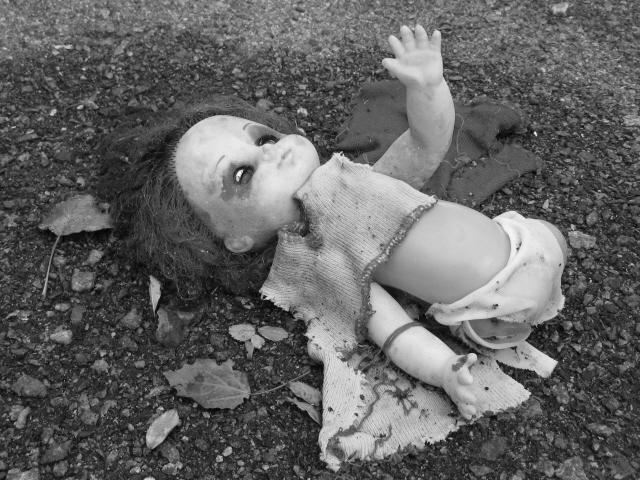 And obviously all those dolls with gas masks strapped to them, or other poignantly placed toys, are the result of outside “interference” as well. 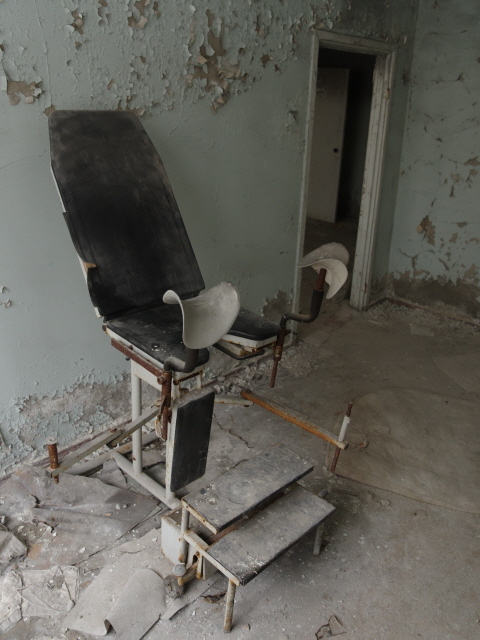 This is why some photographic adventurers of the “Urbex” (urban exploration) persuasion have on occasion been somewhat dismissive of what there is to see in Pripyat. But I don't think that is really justified. An atmospheric arrangement that has been put together to be so atmospheric, still is that atmospheric, even if it is not “authentic”. 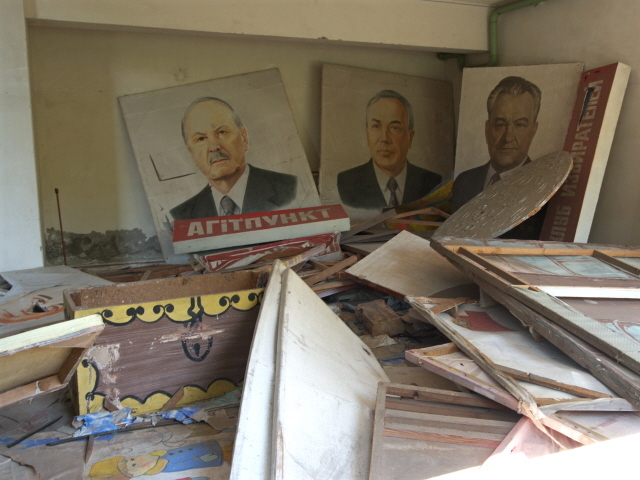 And there is plenty of “authenticity” still about in Pripyat to satisfy those in search of it. In fact the interfered-with bits are not so representative as to justify such general dismissiveness. 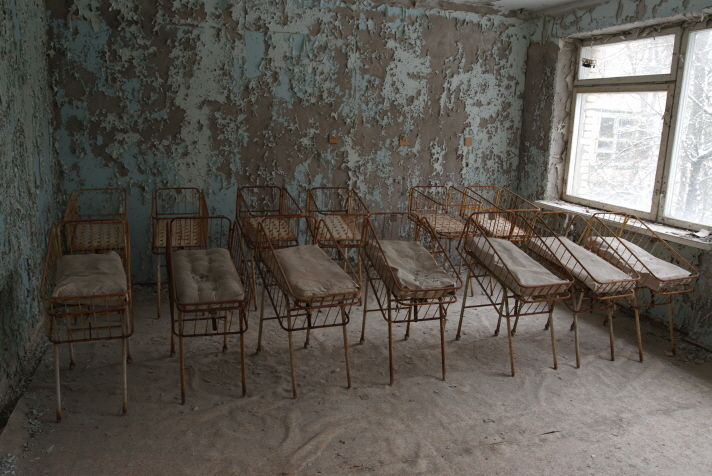 Perhaps surprisingly, Pripyat was not altogether abandoned after the accident, even though all residents had to leave. 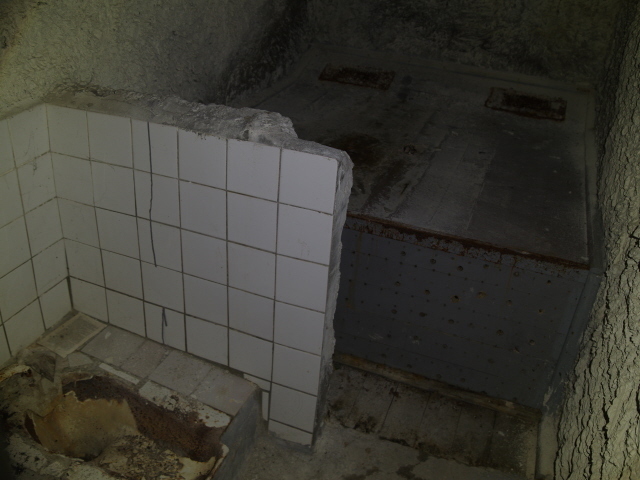 But some of the facilities were still used after that – such as the famous “Azur” swimming pool, which remained in use until 1996. 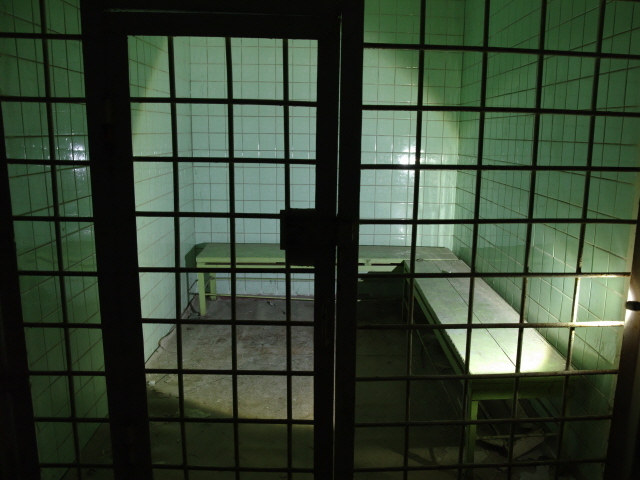 Two laundries were also kept in operation, one at a hospital. Highly contaminated clothing of “liquidators” and plant workers are stored in the basement of that hospital! This is obviously one of the spots to avoid and is naturally never part of the official tours. 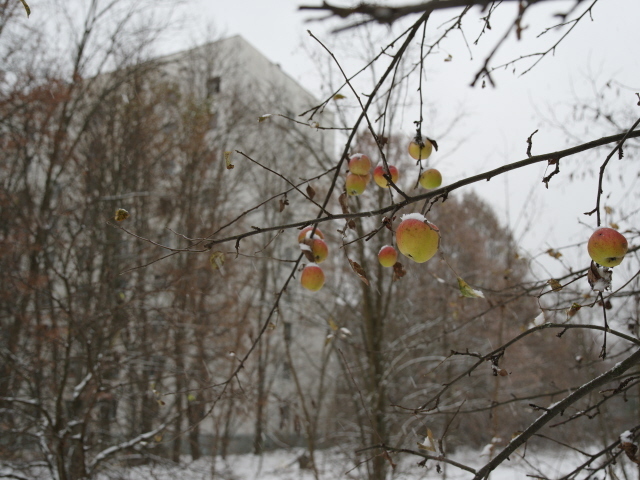 What there is to see: A lot – More than anywhere else within the Chernobyl Exclusion Zone. 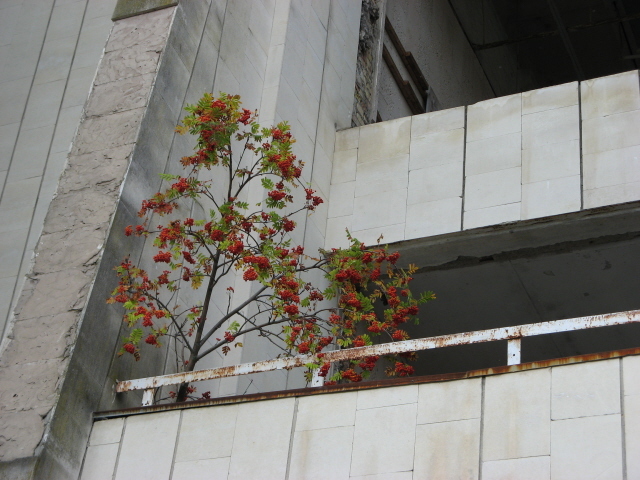 For many visitors, Pripyat is the very highlight of any such tour. How much you get to see depends crucially on the type of tour you are on. The short day return tours from Kiev have at best only a couple of hours for Pripyat and concentrate on the best known locations. 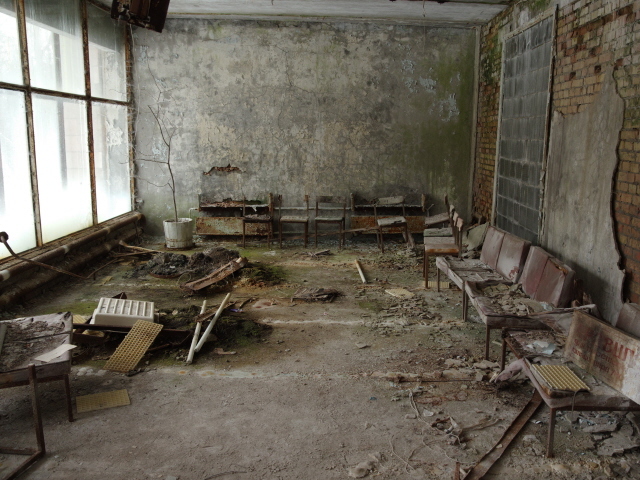 To explore deeper you'd need one of the longer tours that involve at least one overnight stay in Chernobyl town. 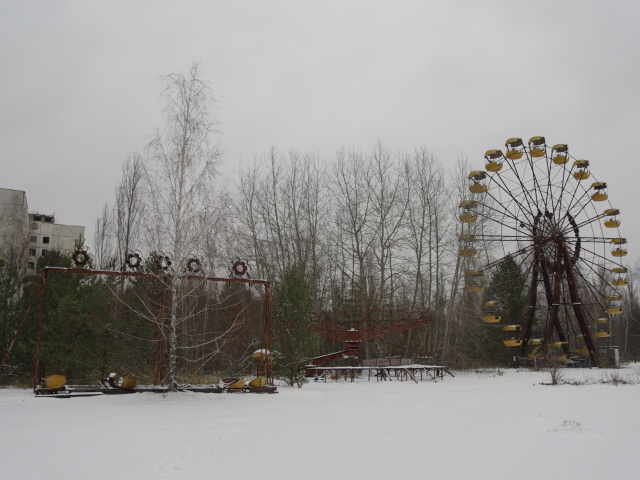 Amongst the main sights and best known parts of Pripyat are certainly the funfair with its iconic, decaying Ferris wheel, as well as the main square with the former cultural centre, restaurant, shops and the Hotel Polissya (whose roof still proudly proclaims that name in large Cyrillic letters). 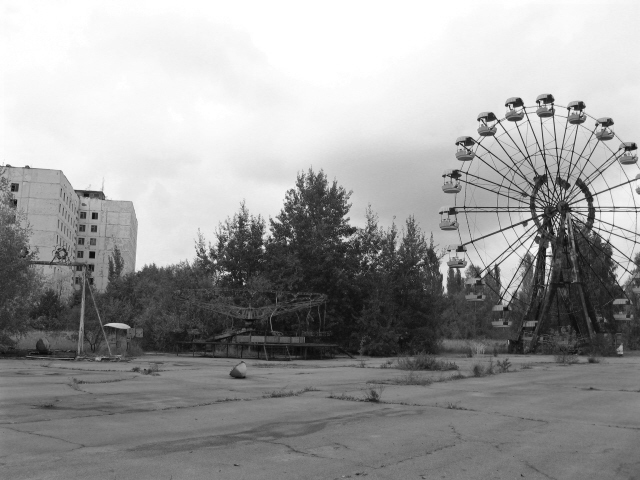 The Ferris wheel is probably the best known and most recognizable icon of Pripyat. It is part of a small funfair that was supposed to open for May Day in 1986 – but obviously couldn't because all the inhabitants had been evacuated just days before. So the Ferris wheel and other rides are just quietly rusting away. Apart from the Ferris wheel the funfair also consists of a bumper-car track with several decaying cars looking like they were stopped in mid-ride. Unfortunately they have also been strayed with simple graffiti (tags, rather than anything imaginative), which somewhat detracts from the beauty of decay at this spot. A merry-go-round has been spared this interference but it looks in pretty bad shape by now … but still in that aesthetic kind of way of dilapidation. 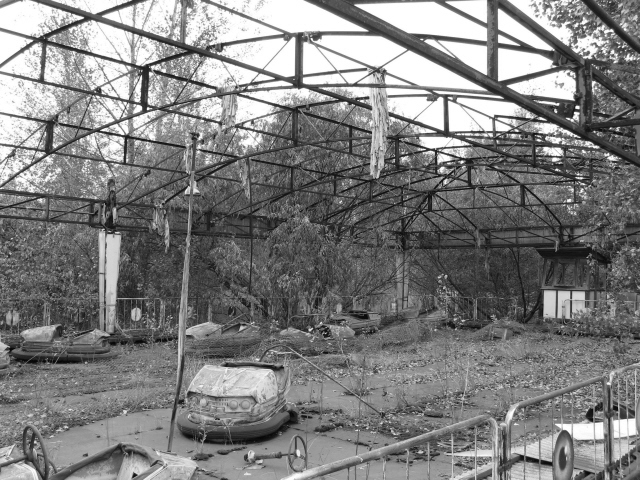 The set of swings, on the other hand, has decayed almost beyond recognition since my first visit to Pripyat in 2006. 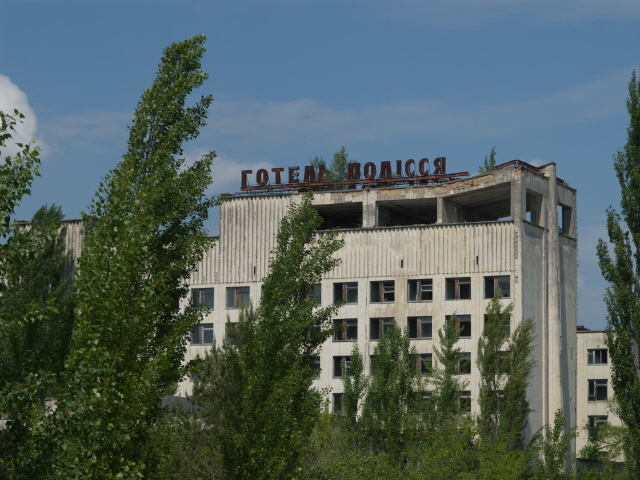 When I was there in May 2015, a film crew flying a large camera drone was using Pripyat as the backdrop to some scenes ... for some kind of disaster movie I guess. (I saw the film team at the checkpoint to the Zone and overheard the crew leader explaining that they only needed certain images and that they'd later use CGI to put London in the background! Sounds intriguing – hopefully the outcome will be better than that poor “Chernobyl Diaries” flick). We suddenly heard and saw the drone overhead and I hope we didn't spoil the shot by inadvertently walking into the frame. And when I returned in November 2018, the first snowfall of that year transformed the whole scene into something even eerier. Since we were the first to arrive there in fresh snow, there were no footprints left by others yet, which made the place seem even more forlorn and abandoned. The creepiest bit was that the wind made the merry-go-round slowly turn, as if by itself, and every so often the turning of metal on metal emitted a faint, otherworldly screeching sound, which sounded almost like some invisible ghost's singing. Magical! The other main standard point of interest that all tours visit is the main square with the old cultural centre at its core. You can peek inside the restaurant next door and next to that into what used to be a supermarket. Spot the rusty frozen food cabinets! It all looks pretty damaged and war-zone-like. Whether you'll also be allowed to go inside any of these buildings will also depend on your tour guide. I know that, officially, visitors are no longer allowed to enter any of the apartment blocks, but with these buildings it is not so clear. Going by the large number of recently posted photos online I would guess that many tours do go inside some of these buildings on a regular basis. My guide also led the way into the cultural centre ruin, and it didn't appear all that risky. Time and looting had taken their toll on the interiors, but the building did not seem to be structurally unsafe, let alone on the brink of collapse. The best bits for me inside were the auditorium – stripped mostly bare, save for three theatre seats that are still in place looking very forlorn (and sans upholstering), as well as the old wall murals depicting the bliss of happy old Soviet days, in that typical socialist (un)realist way as well as some rather more modernist artistic styles. 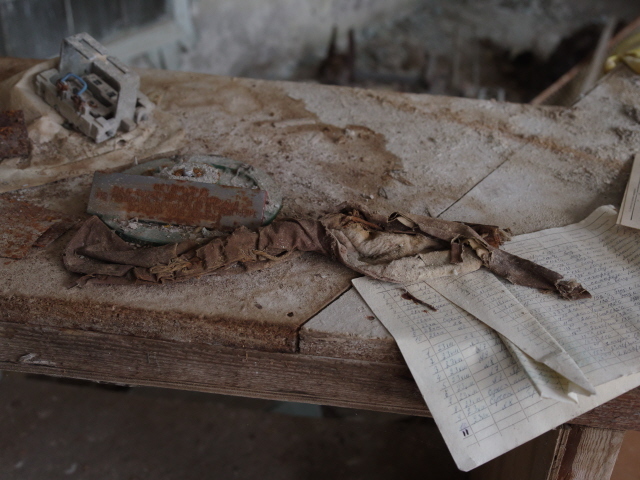 We then headed off by car to one of the abandoned schools, where we were free to clamber about on the two floors at will for quite a while … and there is lots to discover. 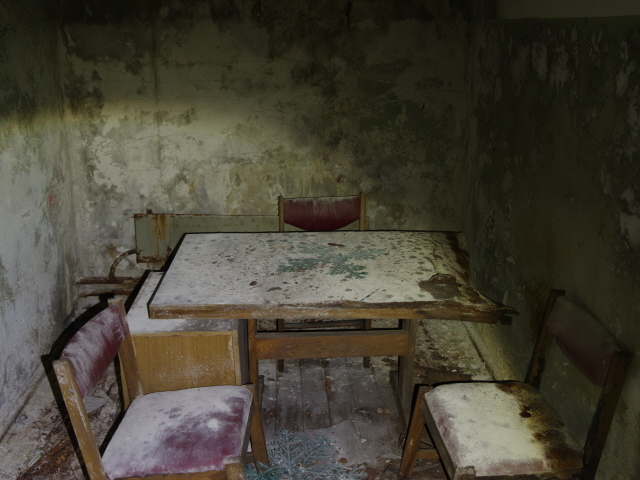 It is also here that many of the most frequently encountered photos of the eerily atmospheric abandonment were taken. Especially recognizable is that floor covered with gas masks! 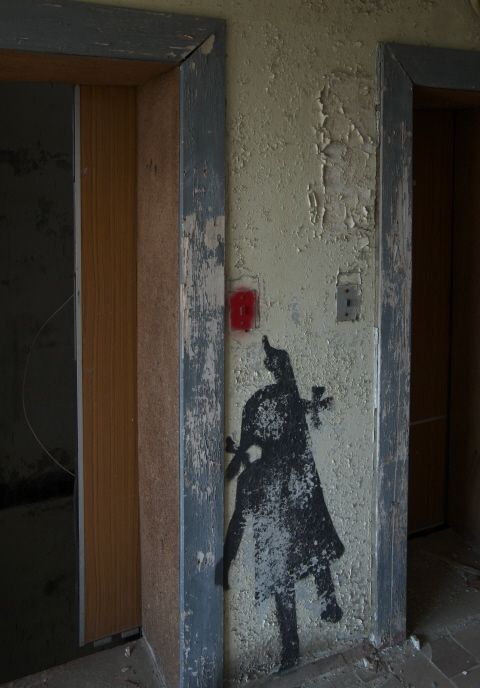 A few dolls have been “fitted out” with gas masks too, again, probably by some previous visitors. I know some purists don't appreciate this kind of interference, but I really didn't mind. It does give you extraordinary photo ops, whether authentic or not I found of secondary importance. Other rooms in the school looked more like a violent tornado had hit them. 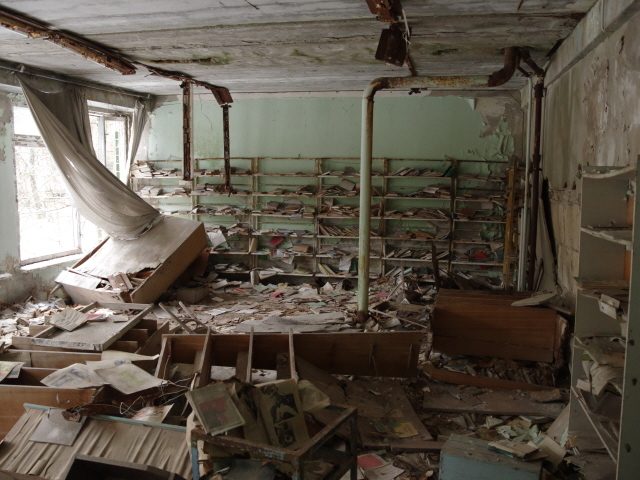 In one room the entire floor was covered in old schoolbooks at least ten inches deep. You can spot many odd and curious details, provided you can read Cyrillic (and preferably also understand a little Russian or have somebody to translate for you). Though often enough the pictures in the books are self-explanatory in themselves. 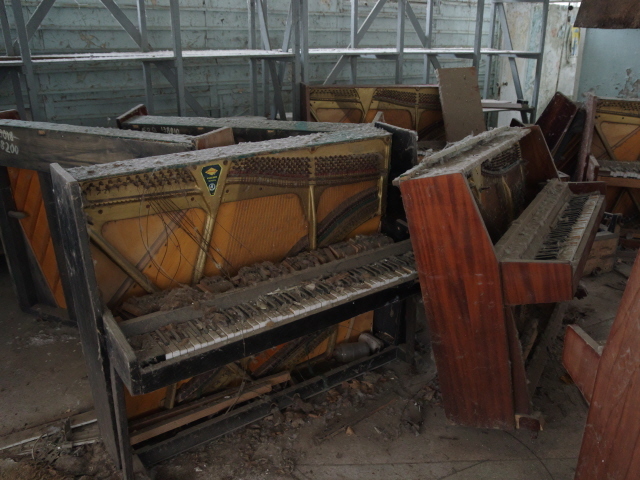 I also found the music rooms quite touching – with their badly damaged pianos, but with musical scores placed on the no longer existing keyboards … I presume the keys must have been stolen (could they still have been genuine ebony and ivory perhaps?). Sad to look at in any case. On we headed to the swimming pool. 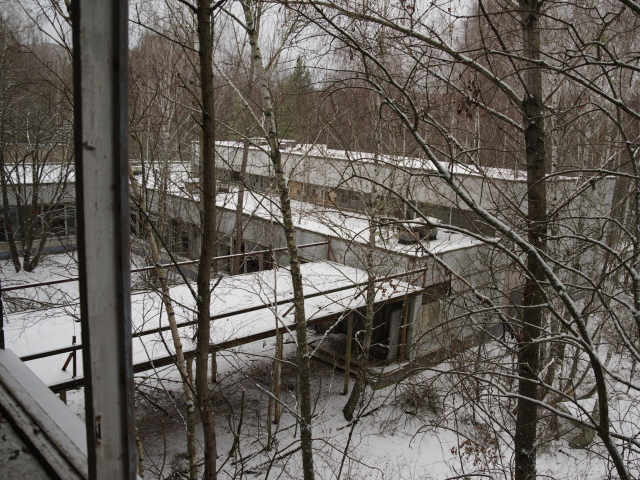 This too is a much-visited location in Pripyat. The vast empty basin is certainly striking. But nowhere did I find the added graffiti more annoying than here. 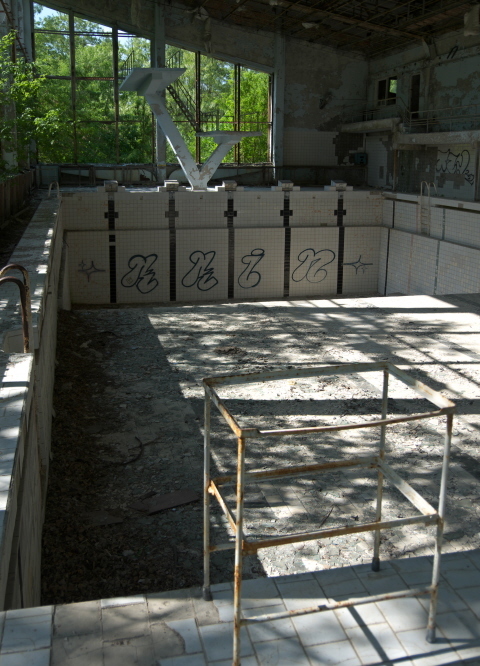 Some egocentric prankster “took possession” of this site by spraying four huge letters on the rear tiles at the deep end of the pool, right underneath the diving boards – thus destroying the image (and chance for cool photography) for everybody else since. The diving boards, by the way, can no longer be climbed (or not by normal means at least) – the bottom part of the access steps has been removed. Whether by looters or quite officially as a safety measure, I don't know. Shame, I would have liked standing up there and taking photos from that perspective. Speaking of up … I'm glad I've also once had the chance to climb the tallest of the apartment buildings in Pripyat and to take some panoramic shots from there – now that this is no longer (officially) allowed. 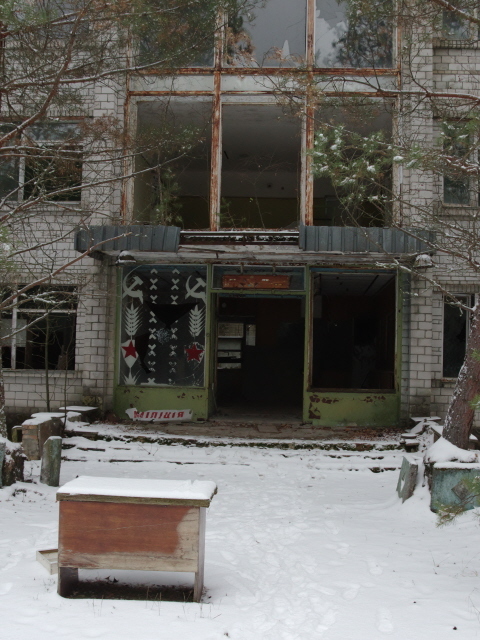 I saw the reason why this regulation has been introduced: my guide took me to one of the partially collapsed buildings in the more remote north-eastern section of Pripyat. This one was formerly School No. 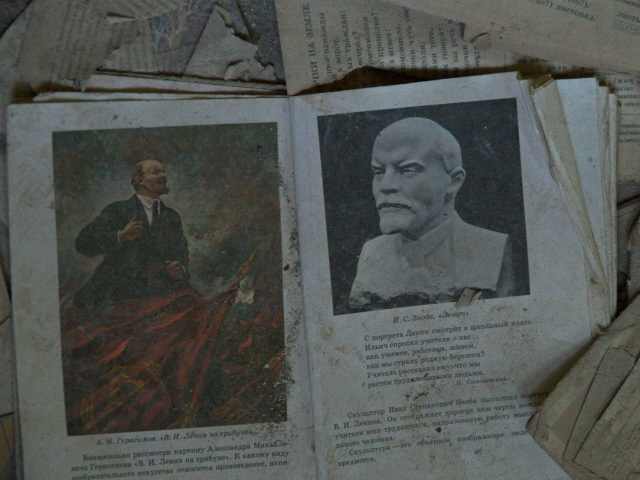 1 – and you can still make out a blackboard and a poster of Friedrich Engels on the wall of one of the exposed, now almost floorless rooms. Apparently there are now three such collapsed blocks. And the fear is, naturally, that more and more will follow as time progresses. Another more off-the-beaten track place I was shown was the former lakeside cafe. This is also a fascinating place. Inside the rear hall are the remains of beautiful coloured glass windows – especially pretty when the light is right and late afternoon sunlight backlights them. Outside the old cafe you can see some more odd Soviet relics, including a couple of vending machines (for water and possibly other soft drinks), now rusty and decayed, but one cup was still placed under the nozzle of one of the machines, just like somebody still tried to use the machine. Or was a resident of Pripyat interrupted by the sudden onset of the evacuation back in April 1986 and left the cup here in their hurry? Or maybe that's just my imagination going wild. From what used to be the lakeside promenade and boat landing stage you can get a nice view over the water. In the distance you can see some old harbour cranes. Closer to the cafe a pleasure boat or houseboat lies partially submerged at an angle. Beauty in decay, yet again. 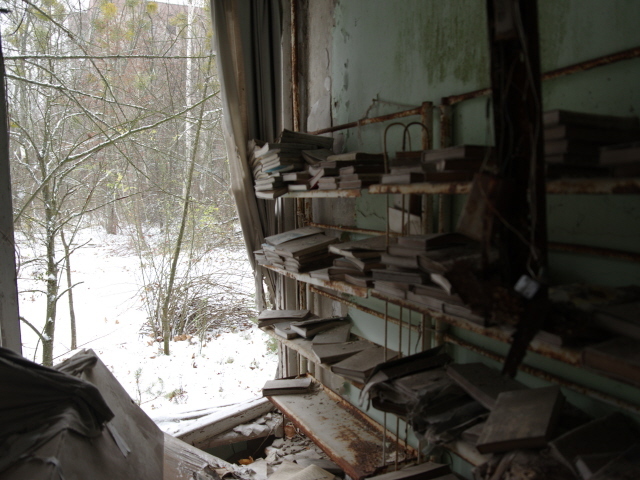 There is plenty more of it to be found in Pripyat if you have enough time. On my return trip in November 2018, I explored some more buildings of interest. 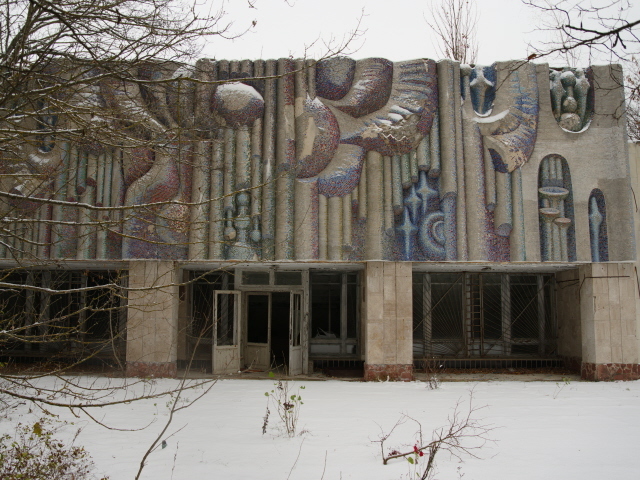 This included the post office with its fantastic wall mural involving a cosmonaut, or the secure storage rooms for pianos left behind by residents, together with other valuable items (such as TVs), at the time of the evacuation. 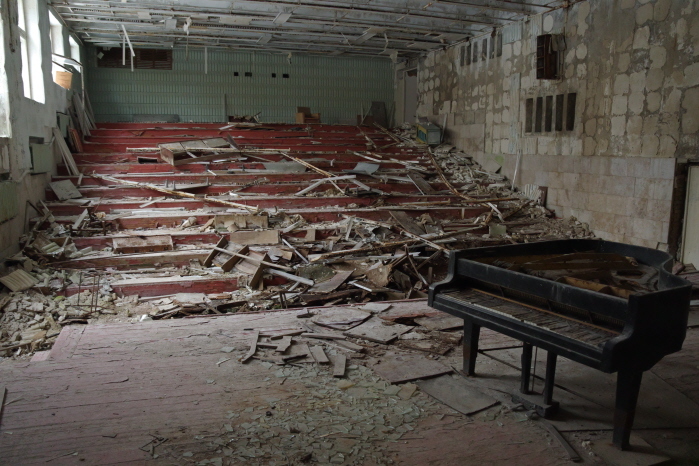 Quite atmospheric was also the beautifully decaying former barber’s shop, or the music school with its battered grand piano on a decaying stage in an auditorium already stripped of all its seats (photo No. 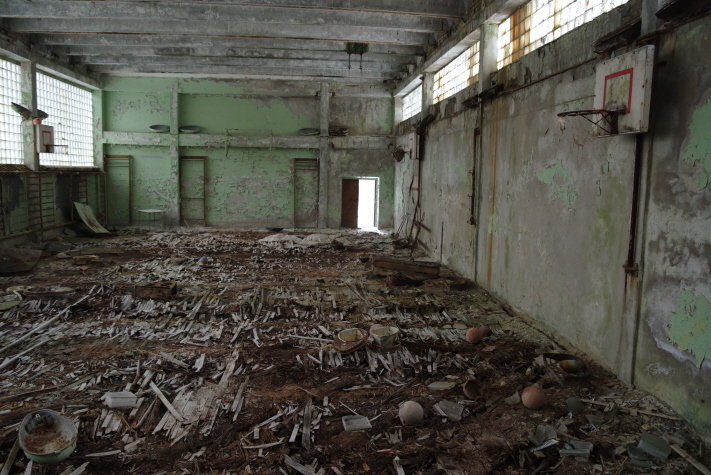 66 in the gallery below may look familiar – it is indeed one of the most popular angles for photography in Pripyat). Perhaps the most rewarding building to enter (discreetly and quietly, of course, you don't want to be discovered doing so by the police!) is the hospital. 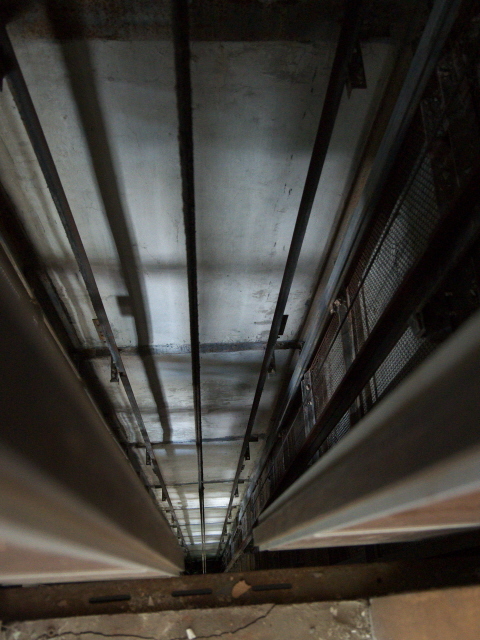 Urban explorers can have a real field day in here. We spent a few hours in the hospital, but I was told that dedicated visitors on multi-day photography-focused trips said they could a week in this building alone. It's so chock-full of interesting details. 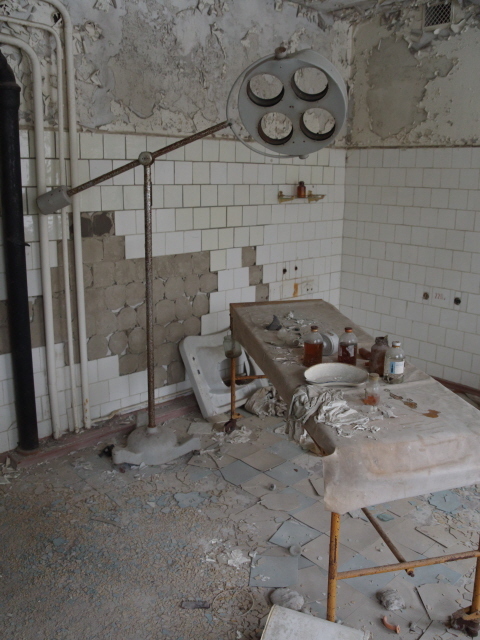 Highlights include remnants of the operating theatres, the cabinets still with meds in them, the waiting room, the delivery room in the gynaecological ward … and the adjacent rooms with baby cots. One of them has two neat rows of these tiny bed frames. I've seen older photos online where these beds were just scattered about. So somebody must have made the effort to arrange them this neatly at some point. The spookiest bit, however, isn't much to look at, just a mysterious bit of cloth lying on a table on the ground floor, but it is from the basement. More precisely: from the storage of the clothing, boots and helmets of those first responders, i.e. 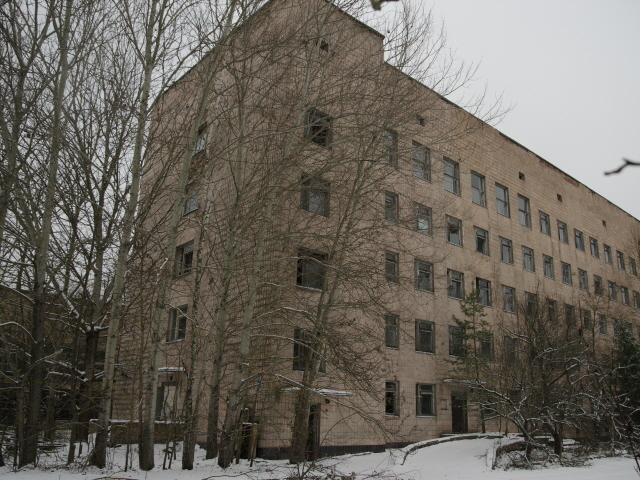 firefighters who early on 26 April 1986 were sent to the exploded and burning reactor of the NPP without any proper radiation-protection gear and were hence massively exposed to extremely high levels of radioactivity. Many received lethal doses. They were all first brought here when they began to show symptoms and were then soon transferred to a specialist hospital in Moscow. But their clothing was simply left in this hospital's basement and is still there. Some foolhardy explorer must have gone down there and dragged this item up. We, on the other hand, gave the stairs to the basement a wide berth. I've even heard the story of a fireman's helmet from the basement storage at one point appearing at ground level (and still emitting 168 μSv/h of radiation), but later it disappeared, suggesting that perhaps some idiot had taken a very dangerous souvenir home … (though you have to wonder how you could get something like this through the checkpoints of the Exclusion Zone). We also visited yet another school (I think it was referred to as “School No. 6” but I'm not sure) and then moved on to the Jupiter factory and the police station. The Jupiter factory was also cool to visit. Abandoned industrial plants have a special allure for me in any case, and here obviously even more so. 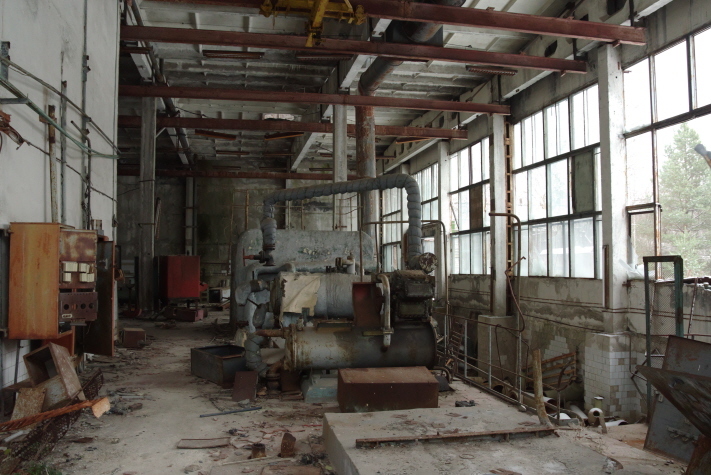 Apparently the Jupiter factory produced electronic components, especially for tape recorders, but my guide also told me rumours of a basement (now flooded) where allegedly parts for nuclear weapons were manufactured. I have no way of knowing for sure whether that's true but I have some doubts. 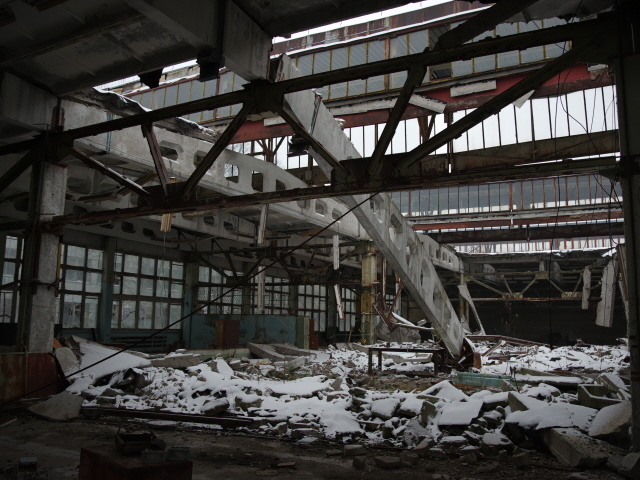 Nevertheless the silent factory halls were visually appealing, though the part where a section of the roof has collapsed made you wonder for how much longer it will be safely possible to go inside such a structure. Eventually, of course, everything here will collapse. It's just a question of when. In the backyard of this complex, too, were several abandoned vehicles including buses, one of which was lying on its side as if pushed over by some giant or angry mob. 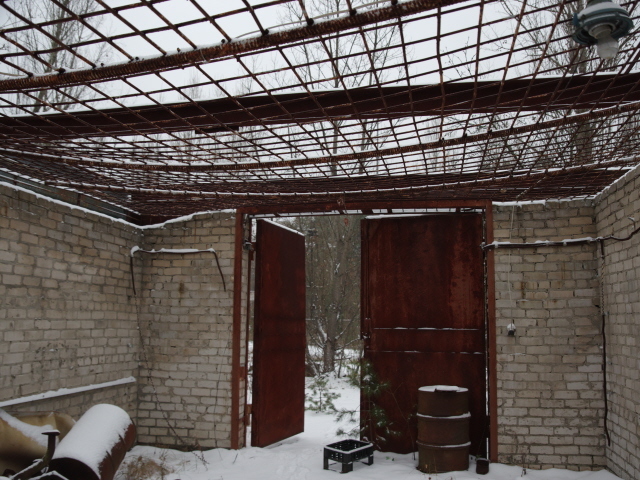 Finally we also took a brief look at the Pripyat fire station – from where some of the early firefighters at the scene of the disaster must have come from ... (all fire stations in what is now the Exclusion Zone were apparently involved – except the one at the secret Duga facility). 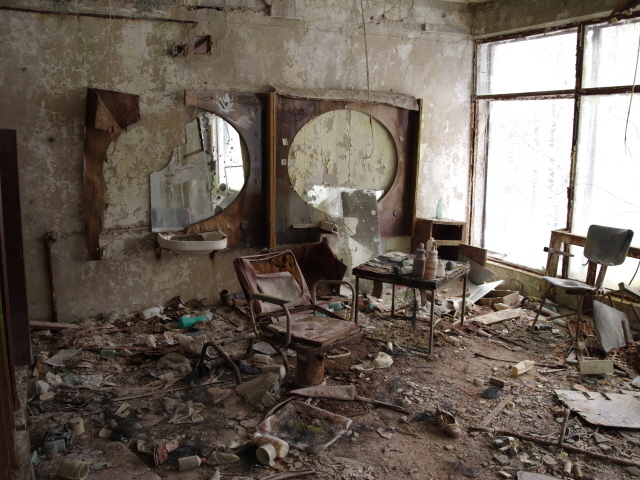 So by now I've been to Pripyat three times, but I still haven't seen everything. I'm sure you could poke around for a week here and still discover more. Yet more points of interest include the Yanov railway station, yet more schools and kindergartens, or the infamous, still highly irradiated “claw” (used by a crane to lift out excessively contaminated debris from the stricken reactor block in 1986)… and there's bound to be more still that I haven't even heard of yet. 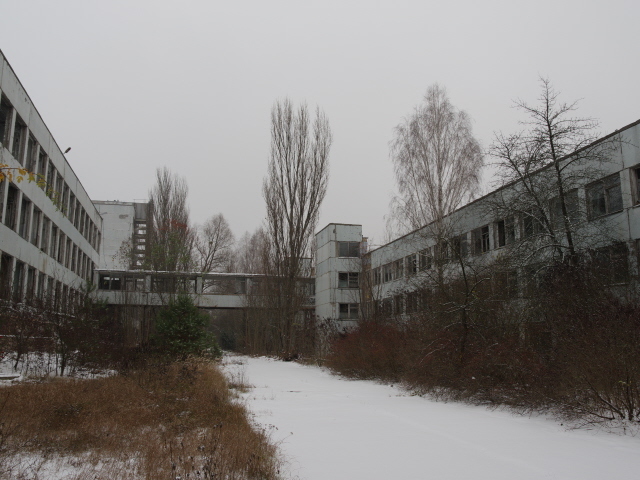 In any case, whether just for a couple of hours of getting a first impression, or whether for days of (urban) exploration, Pripyat is rightly one of the most famed ghost towns in the world and without any doubt one of the top dark-tourism destinations on the planet – together with the rest of the Chernobyl Zone, of course! 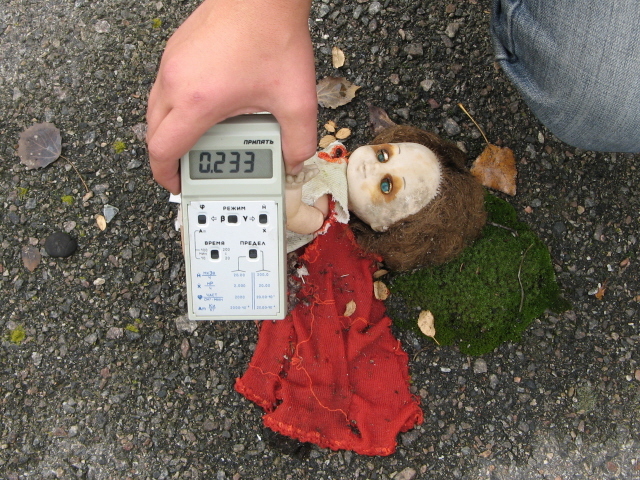 Location: some 2 miles (3 km) west of the Chernobyl NPP, right in the middle of the Chernobyl Exclusion Zone, Ukraine. 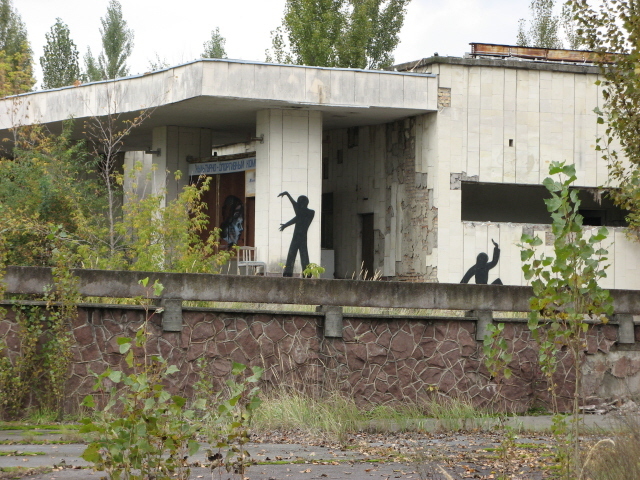 Access and costs: Only as part of a Chernobyl tour – which can vary a lot in price and in what is included. Details: Pripyat is probably the key ingredient in every tour of the Zone, perhaps together with the actual Chernobyl NPP itself. 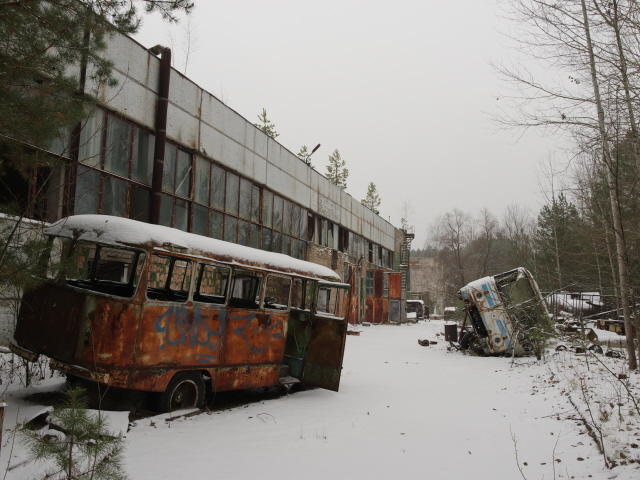 For details on the range of tour options as well as prices see the relevant section in the general Chernobyl chapter. Note that the normal day return tours from Kiev allow only limited time within Pripyat, so that only the main sights can be included. 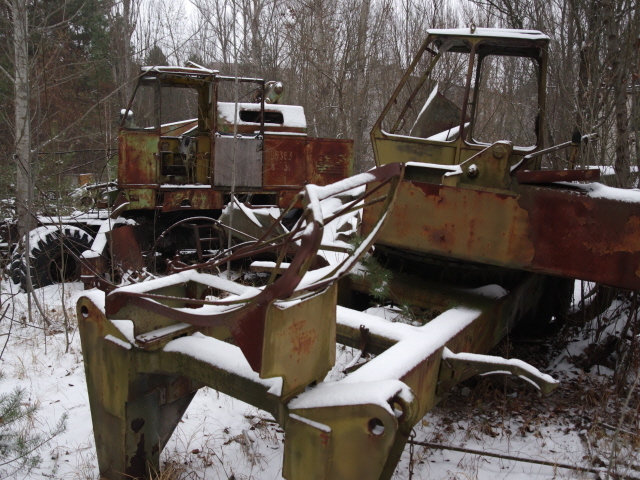 To dig deeper (metaphorically speaking – you obviously can't dig around here literally) you have to go on one of the longer arrangements that include at least one overnight stay in Chernobyl. Safety and regulations: you are officially no longer allowed to go inside the any of the abandoned buildings – as many of these have become too structurally unstable. A few have already collapsed. 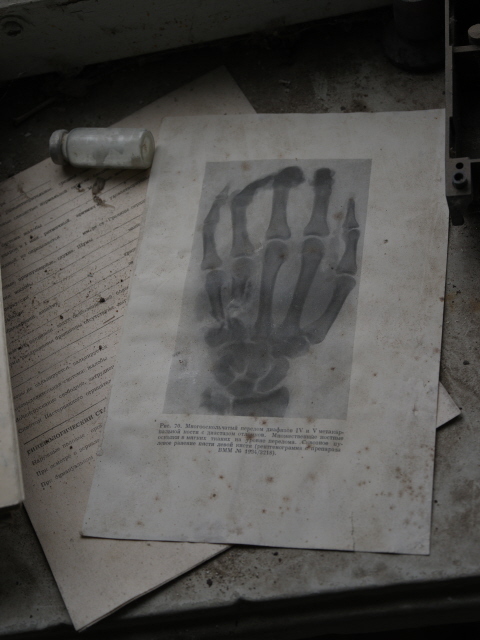 In general, the greatest risk while exploring Pripyat is not from radiation but from the dereliction itself that is all around. Getting near (or inside) any buildings does carry a certain risk. Things might fall from ceilings, floorboards may give way, you could trip over things, or stumble into holes covered by vegetation. Do take care. And if you do get hurt you can't hold anybody liable, as you have to sign a form to that effect as part of your permit. Ambient background radiation (i.e. 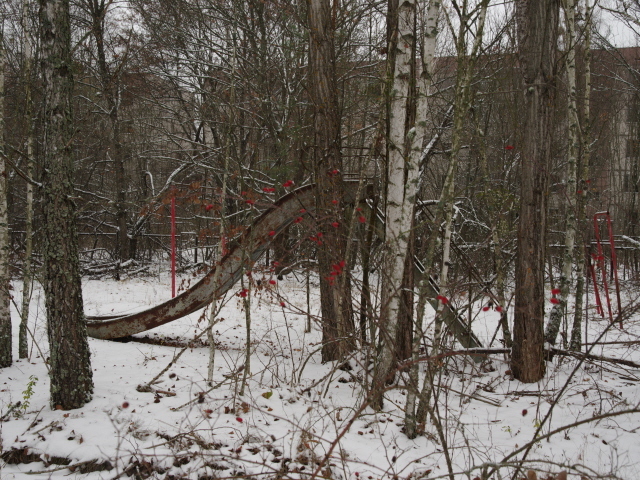 in the air) within Pripyat is only elevated to any significant levels at certain hotspots (e.g. the school courtyard or one of the hospital basements). And it's your guide's responsibility to point them out and steer you away from them. Otherwise the general rule is that you should try and stay on concrete or tarmac and other solid surfaces and avoid walking on vegetation (especially moss). And also avoid touching anything. As this cannot necessarily be avoided all the time, make sure to thoroughly wash your hands after the tour at the first opportunity. Some visitors also decide to wear shoes that they can ditch afterwards. Shoes have to be closed and sturdy (no high heels here!) and you should also wear long trousers and sleeves, especially if your tour includes more in-depth exploration. The no-touch rule also means not taking anything away from the Zone and not altering anything. I know some previous visitors obviously have done just that, but that's no model for behaviour. Do not add to the disturbance of this exceptional site. Just look and take only pictures and memories. Time required: between around two hours, as part of the regular day return trips from Kiev, and several days, depending on the type of Chernobyl Tour. The short tours allow only for good first impressions; only the longer ones can include more in-depth exploration. 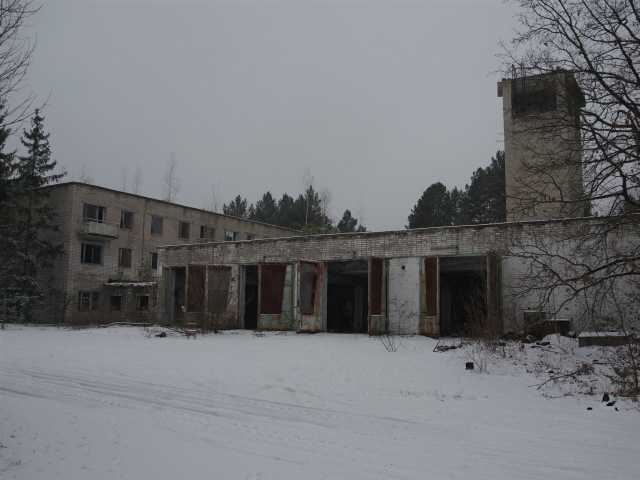 Combinations with other dark destinations: The tours that take visitors to Pripyat already come pre-combined with at least a short stop at the viewpoint at reactor 4 of the old Chernobyl NPP, and with Chernobyl town, as well as possibly some other stops within the Exclusion Zone. Most tours now also incorporate a visit to the fascinating Duga installation. And back in Kiev, that city also deserves some time, not least the Chernobyl Museum, which also has plenty of Pripyat-related things. 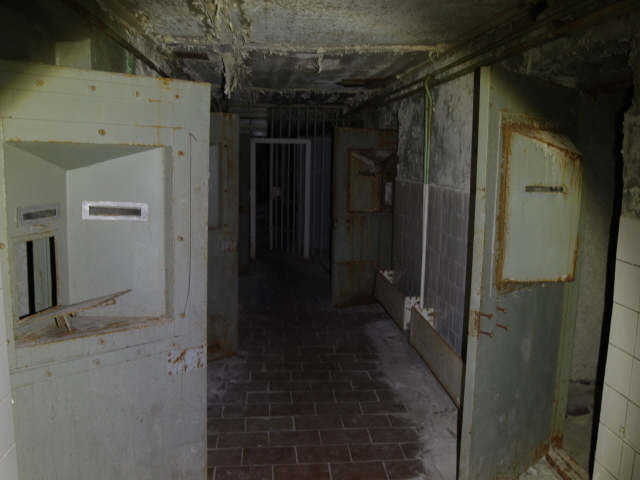 Combinations with non-dark destinations: see under Chernobyl in general.